The Storm Women's Skye shoe is part of Storm's Women's Athletic line of bowling shoes. 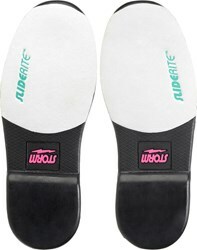 This universal slide sole shoe has a sporty multi-color design. 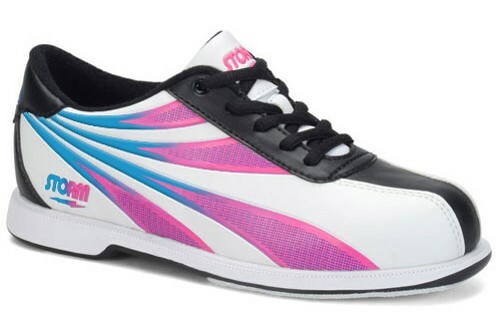 This shoe goes beyond basic and is value priced and great for any bowler. This show runs too narrow. I've always worn a regular width and these are too tight. The True Fit option is designed to cover the exchange fees if you needed to change the same shoe for a different size. It also speeds up the exchange process. For more details on the True Fit, there is a details button beside the True Fit offer above which can give you all the benefits of this option. Hi Barbie, unfortunately these shoes are only made in a standard B width. The shoes should run pretty true to size but what you call true to size can be different than what someone else calls true to size so there is always some confusion on this. To avoid any possible troubles, we offer a True Fit option which should help you get the size that fits best on this shoe. Hello Kim. The only color that we have for this shoe is as advertised. It will be a pinkish purple that fades into blue. Hello Carrie. These soles should not be flush with the edge. This shoe does not come in a size 3. The smallest we offer is a 6. Why do they have slide soles on both feet? Hi Gabby! These are universal soles. They are for left handed or right handed bowlers. Are the pads replaceable on them? Hello Tiff. Unfortunately, these will be universal fixed soles. These soles will not be replaceable. does this shoe come in xwide? Hello. Unfortunately, this shoe does not offer a wide width version. Are these shoes true to size or do you have to up size or down size? Unfortunately, these will be a standard B width. We would recommend going up to a size 11.
do they come in W width?? Hello Lizzi! Unfortunately, we only have this shoe in a regular B width. These do not come in wide width unfortunately. They are only in standard B width. You may search under the wide width category to see what shoes are available in wide. I am looking for a shoe that slides (i do not want to use easy slide anymore). Does this shoe slide easily or is it best to get the interchangables? It is probably best to get the shoes with the interchangeable soles, so that you can pick the slide sole that you need the most instead of being restricted to a fixed slide sole. Due to the time it takes to produce the Storm Womens Skye ball it will ship in 2 bus. days. We cannot ship this ball outside the United States.